When our daughter Kristina came home for Christmas and said she wanted to prepare a fresh ham, I was delighted. I also knew there would be tons of leftovers. 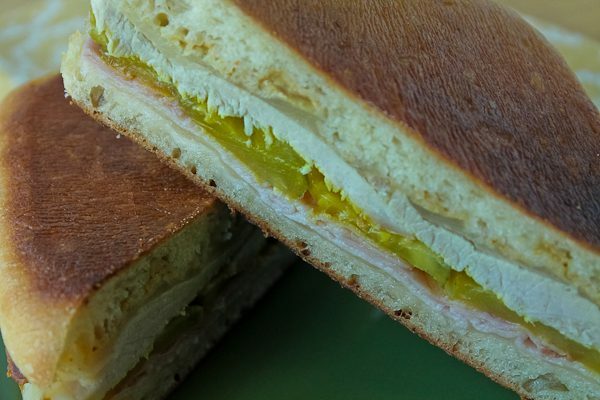 Since a fresh ham does not taste like a ham as most people think of it (it tastes like a great pork roast), my first thought was a Cubano sandwich, which uses thick slices of pork. It also has a layer of ham, so I used deli smoked ham which worked perfectly. 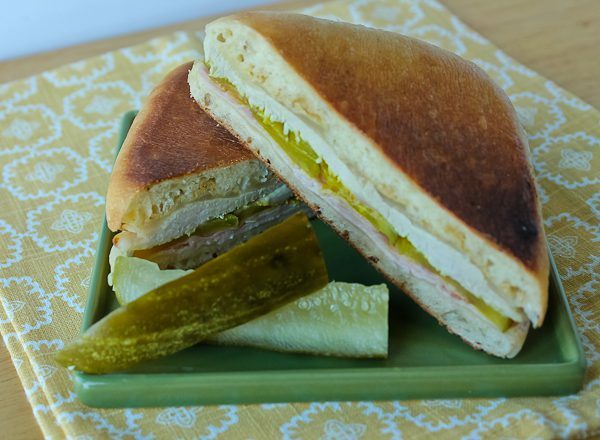 A Cubano sandwich has basically the same ingredients, pork slices, ham slices, dill pickles, cheese (I used Swiss), mustard, sometimes mustard and mayo both, and served on a roll like a bolillo, but I used ciabatta rolls which were the perfect size. I have seen some Cubano sandwiches grilled and some not, but I preferred to grill it in my cast iron skillet pressed down with another skillet until it got crispy and so delicious. After the roll is split, one side is spread with Dijon mustard, the other with mayonnaise. On the bottom half, a slice of cheese is the first layer, then some deli ham, pickle slices, pork slices, another slice of cheese, and topped with the top of the roll. The sandwich is buttered on the outside and grilled. This can be done in a sandwich grill pan or a cast iron pan with another cast iron pan on top to flatten it. The sandwich is warm, satisfying, and irresistibly crunchy. Split each ciabatta roll and lay out on work surface. Spread bottom halves with the mustard; spread top halves with the mayonnaise. Place a slice of Swiss cheese on the 4 bottom halves with the mustard. Divide the deli ham evenly and place over each slice of cheese. Divide the pork slices (or fresh ham) on top of pickles. Add remaining slices of cheese on top of pork. Place mayonnaise-spread top of bun on pork. Spread the rounded tops of bread with softened butter and place buttered side down in a large cast iron skillet. Turn heat to medium, then place another large skillet on top of sandwiches and press down lightly to flatten sandwiches. (you can also use a panini maker or sandwich maker, or George Foreman grill). Watching carefully, grill for about 4 minutes or until golden and crispy. Before flipping sandwich over, brush the sandwich with more softened butter. (If using something like a panini press, butter both sides at once). Flip sandwich over in pan and cook another 3 minutes or until golden and crispy, pressing down again with another heavy skillet if the sandwich has not flattened out. Remove from pan, let cool slightly, then slice diagonally and serve hot. Makes 4 Cubanos. 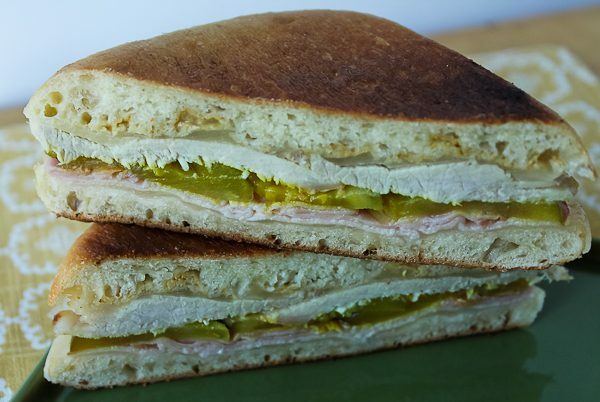 Loooooove a good Cubano sandwich. They are so easy and tasty! I don’t know why I don’t make them more often.